Ikari Warriors is a 1986 arcade game by SNK, published in the United States and Europe by Tradewest. 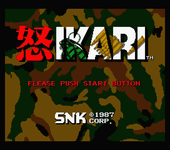 Known simply as Ikari (怒 ?, literally "anger") in Japan, this was SNK's first major breakthrough US release and became something of a classic. The game was released at the time when there were many Commando clones on the market. What distinguished Ikari Warriors were rotary joysticks and the two-player mode. Source: Wikipedia, "Ikari Warriors", available under the CC-BY-SA License.